Flow Chemistry is everywhere. Chemistry students are studying it, chemistry professors are perfecting it and R&D labs are working with it every day. But do you know why chemists across all industries and academia are switching to continuous flow techniques for their chemistry? They know how it works and what they can achieve from it. You might know what Flow Chemistry is, but do you know what benefits will your lab see by performing chemistry in continuous flow? If you’d like to get more familiar with flow chemistry before going in too deep, be sure to read our blog post about Flow Chemistry Basics & Key Elements. Even though Flow Chemistry can bring numerous benefits, not all chemistry can be performed in continuous flow. If you are looking into flow chemistry systems, make sure you have a thorough look over every aspect of your processes. Be sure to get in touch with our Sales Team. We would love to discuss your chemistry needs - whether it is Flow or Batch! Remember that together with our partner Syrris, we deliver over 16 years’ experience creating lab- and pilot-scale flow chemistry systems and will be happy to provide you with feasibility studies or examples of similar customers successfully using one of the systems we have available. How does flow chemistry achieve faster reactions? The increase in reaction rate possible in flow largely result from the ability to achieve higher temperatures. It is much easier to pressurize flow chemistry systems than batch chemistry systems, and higher pressures enable higher temperatures; according to the Arrhenius equation, higher temperatures result in faster reaction rates. The table below demonstrates the boiling points of dichloromethane, methanol, and water at a variety of pressures. Flow chemistry systems, such as the Syrris Asia, can pressurize to 20 bar, enabling an increase in the boiling point of solvents by 100-150 °C. The Arrhenius rate law tells us that reactions are 2 x faster for every 10 °C rise, therefore a 100 °C rise would result in 1000 x faster reactions (2x2x2x2x2x2x2x2x2x2 faster). How does flow chemistry enable safer reactions? The safer reactions capable in flow are made possible because the quantity of reaction occurring at any one time is minimised. Reactions in continuous flow occur as small amounts of liquids are mixed through glass chips, whereas in a batch chemistry reactor, the entire reactor contents are mixed at once. As an example, if a 10 L batch reactor were to explode, the consequences could be incredibly serious, or fatal. The same 10 L of reagents could be passed through a 10 mL flow microreactor chip, ensuring that only 10 mL is reacting at any time. A fast batch reaction e.g. a one-minute reaction in a batch reactor can be achieved with an overnight run in a flow system. In this example, the risk in continuous flow is 1/1000th of the risk in batch. How does flow chemistry enable faster reaction optimisation? One of the main reasons why chemists are switching to or investigating flow chemistry is its ability to enable much faster reaction optimisation, thereby reducing costs and saving chemists valuable time. In continuous flow, one reaction is flushed out by the next - separated by a solvent - therefore only one continuous flow chemical reactor is needed. In the lab, chemists can investigate 50-100 reaction conditions with just 15 minutes set-up time. What is library synthesis, and how does continuous flow achieve it more efficiently than using traditional batch techniques? Library synthesis (or high-throughput chemistry) describes the synthesis of many analogous compounds for the purposes of testing. Library synthesis is a crucial technique for rapidly exploring the chemical space of a molecule, allowing for the quick identification of lead compounds and is especially useful in drug discovery and development chemistry. Traditionally, library synthesis is performed using traditional batch methods in multiple small flasks and vials, such as the Atlas Orbit system. However, modern sophisticated flow chemistry systems enable fast, serial library synthesis and purification of 10s – 100s of compounds a day with total automation of liquid handling through the use of automated reagent addition and product collection modules. How does continuous flow chemistry achieve reaction conditions not possible in traditional batch methods? As an example, chemists can deprotonate a substrate at low temperature then add a nucleophile and instantly heat to a high temperature. How can continuous flow reactions be more selective than in traditional batch reactions? Poor selectivity in chemistry stems from variations in temperature, concentration, and addition/stirring rates. 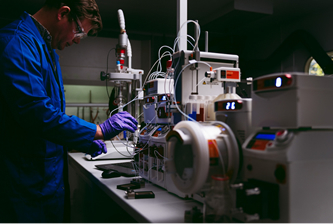 Advanced batch reactor systems, such as the automated Atlas HD jacketed reactor system, automate the chemical steps, helping to minimise these variations, but for finer control and selectivity, continuous flow chemistry systems are the answer. Why is scale-up easier to achieve in continuous flow chemistry? 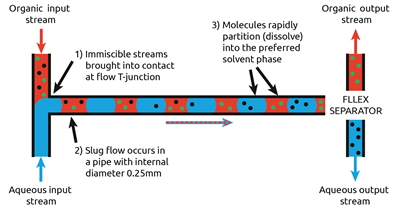 Flow chemistry techniques are not confined to lab scale, as the principles are easily scaled-up and avoid some of the common issues encountered when scaling up in batch reactors. Traditionally, scaling up from lab scale can be difficult and risky. Performing a reaction that is safe at lab scale (e.g. 5 litres) in a much larger volume (e.g. 50 litres) may result in a catastrophic exothermic runaway, hence the requirement for reaction calorimetry. With continuous flow, if you are looking for 10-100x scale up, it is possible to simply flow the reaction for a longer time to make more product, i.e. you could fill a small cup or a large bath from the same time, over different timescales. For 1000x scale-up, the fundamental principles of a higher surface area to volume ratio means that scaling up in flow will reduce the heat transfer effect, and the ability to use static mixers means that mixing is faster and more reproducible. Overall, continuous flow chemistry can save time and money when scaling up reactions. How does continuous flow chemistry enable easier integration of reaction analysis? In traditional batch chemistry, analysing multiple reactions can require multiple probes (one per reactor). In continuous flow chemistry, however, many different reactions can flow “under” the same probe, with the reaction automatically moving to the analytical system because it is flowing. 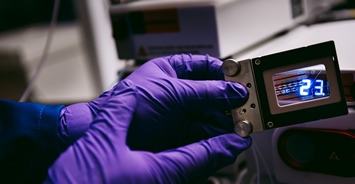 Intelligent flow chemistry systems can include sampling and diluting modules which automatically divert a tiny amount of each reaction for analysis. Why is reaction work-up easier in flow? Traditional batch chemistry relies on a separate operation to perform a work-up, e.g. aqueous work-up, filtration, or solid phase scavenging. In continuous flow chemistry, the reaction is already mobile, enabling in-line (integrated) work-up of liquid-liquid extraction and solid phase reagents/scavengers/filtration. If all these reasons were enough to convince you to make the switch to Flow Chemistry, contact our Sales Team. We will help you find the right system for your application! This year we will be hosting a number of Roadshows, workshops and Seminars about Flow & Batch Chemistry throughtout Ireland. Ensure you don’t miss a show near you by subscribing to notifications on upcoming dates & locations. Keep an eye on our Blog, Twitter and LinkedIn pages as well, for upcoming news. Contact our Sales Team for more information on Flow Chemistry or check out our website to see the Flow Chemistry Systems we have available. You can also read the full article from Syrris here or watch the webinar here.